Rex: "Come on man we can ask for anything, this is our chance." Chazz: "Ok, well in that case I'll take a guitar, a PRS with dragon inlays." Up until recently I played the drums in a band and when I was doing it, it was probably the happiest I have ever been. There is something positively euphoric about performing live or gaining success. It is unparalleled. Unfortunately my band never gained that success, but it was something fun to do on the weekends. In Michael Lehmann's Airheads the members of The Lone Rangers seek out musical success in a different sort of way; they take a Los Angeles radio station hostage. Chazz (Fraser) is the typical rock star wannabe, spending his time fighting with his girlfriend and getting kicked out of record companies trying to get his demo tape heard. After seeing a show featuring a band who made it big after launching their single on a LA radio station, Chazz and his band members Pip (Sandler) and Rex (Buscemi) come up with an idea. They will storm the studio and demand that their tape be played on the air, leading to numerous offers from record companies. But when things don't go as planned, the Lone rangers are forced to take hostages brandishing plastic guns. While the police set up a perimeter around the radio station, hundreds of fans have been listening all along congregate outside the station, demanding for the three to be set free. Perhaps the largest problem with Airheads is its lack of commentary. The film has no real direction; instead it becomes a one-hundred-minute joke about three losers taking hostages in order to get their song heard. Throughout it seems as though Airheads has trouble deciding what it wants to be; a satire, a comedy or a drama about chasing your dream. Screenwriter Rick Wilkes' script plays sort of like a rock-n'-roll Dog Day Afternoon, though comparisons between Airheads and that film are strictly coincidental. Director Michael Lehmann is at times an enigma to me. More so than any other director Lehmann seems to offer a different style each time he steps on a set. From Hudson Hawk to The Truth about Cats and Dogs there seems to be inconsistency in his work. With Airheads, for the most part, he seems to have things back on the right track. The opening thirty minutes of Airheads feel inspired and Lehmann handles the comedy very well, but soon the film starts to slip and does not maintain the quality of the well-done opening scenes through to the end. While the script and direction of Airheads lack creativity, the same cannot be said for its cast. Each of the three leads does wonderful work. Fraser, whose career since Airheads has skyrocketed is very good as Chazz. Buscemi, who is good in nearly everything, stands out as the hyperactive Rex/ The role seems perfect for Buscemi and he does not disappoint. Finally there is Adam Sandler, who has since exploded into stardom, and here Sandler gives perhaps his best performance of his career. His sweet natured Pip is easily the most likeable of the characters and it is odd to see Sandler do such good work for a change. Image Transfer Review: Though Airheads is nearly eight years old, to look at the new 1.85:1 anamorphic transfer on Fox's new DVD one might think it was a more recent film. Colors are vibrant with no bleeding evident, while black levels are perfect with little graininess. No edge enhancement can be found, and sharpness and detail look terrific. This is a wonderful transfer from Fox. Audio Transfer Review: Boasting a Dolby Digital 4.0 mix Airheads isn't the best mix I have ever heard for a comedy, although there are moments where the hard rock music comes pumping through the speakers. The center channel maintains a consistent level of quality, never sounding harsh or distorted. Surround use is limited to the rock soundtrack or ambient sounds. A Dolby 2-channel mix is also provided in French and English. Extras Review: While not a full-fledged special edition, Airheads does offer more than most Fox catalog titles. First up is a fifteen-minute look at the making of the film. While more promotional than informative it is worth watching at least once. Two music videos White Zombie (Feed the GodsBorn To Raise hell) are available. Also contained are 2 TV spots and 3 theatrical trailers for Airheads and two other Brendan Fraser movies (Bedazzled, Monkeybone, and The Scout). 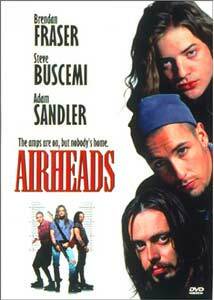 Airheads is a stupid comedy, yet there is no denying that thanks to a talented cast the movie works. A nice transfer and some decent extras make this new DVD from Fox worth a rental, and a purchase for fans of the film.